Metro Car Removal car wreckers buy any make and condition of auto. We are green car recyclers that pay you up to $7000 cash for your car. Give us a call today for a quick cash quote on your unwanted vehicle of any condition. At Metro Car Removal, we are the Car Wreckers in Sydney that are the best wreckers in town. With our knowledge and state of the art facility, we guarantee you that we will get the most value from your old, scrap, accident, damaged, salvage, fire or flooded vehicle. We do this by following the green principles of auto recycling, which means you have an eco-friendly car recycle with nearly 100 percent of your vehicle recycled. With our methods in recycling autos, you get the best value for your car, truck, van, SUV, Ute, Jeep, bus or bike. Whatever the condition of your vehicle, whatever type of vehicle, we’ll buy it for as much as $7000 CASH. At Metro Car Removal, you get the ease of not having to prep your vehicle for us to buy and remove your auto. We pick up your auto and bring it back to our wreckers who will drain all the fuel and liquids, flatten and remove the tyres and then go about dismantling the vehicle to recycle. Liquids that can’t be recycled are contained and properly disposed of, so that hazardous to the environment are not created. Our eco-friendly car recycles in Sydney pay up to $7000 cash. At Metro Car Removal, we come to you with cash to collect your vehicle. 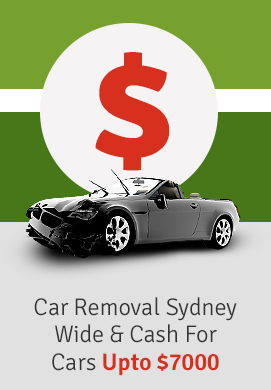 Our Car Removals in Sydney are always free and always pay cash. With the ease of scheduling your car removal when you want it removed, you don’t have to take time out of your busy schedule. We collect autos 24 hours a day. Contact us today for a free car removal in Sydney. Metro Car Removal has the reputation of making high cash payouts and providing our customers with the most convenient services. We are a licenced and insured auto buyer & wrecker that puts the green in your pocket. Cash for Cars – Cash payments of up to $7000 are made at the time we collect your vehicle. Getting a cash Quote is quick and convenient, just contact us and we’ll make you a quote. Free car removals – As the local car removal company near you, we provide car removals in Sydney at no cost to our customers. Get a same day car removal, just give us a call. Eco-friendly car disposals – We follow the green principles of car recycling so that you have the peace of mind of a healthy to the environment disposal and the most cash for your damaged, scrap, wrecked, accident, salvage, fire or flooded auto. Provide the paperwork – We bring a sales contract with us at the time we come to collect your vehicle, so you have the security of knowing that you are selling your auto to a legitimate car buyer. Give us a call today for a quick cash offer with no obligation to take us up on our offer.